It’s inevitable that changes in diet and climate from travelling around our planet will result in the occasional bout of Delhi belly.1 We’ve been very fortunate (and pretty careful) thus far, but when it happens, here’s how we deal with it..
Just as you’ll find dock leaves growing nearby to stinging nettles, we’ve found that there’s always a local cure nearby whenever we catch the Bengali bowels, and it is the simplest, plainest local biscuits you can find. You know the kind I mean, if we were at home in the UK it would be the Rich Tea biscuit or the Nice biscuit – high temperature baked, no extra fancy ingredients, fillings or frostings, just plain, simple, crispy biscuits. In the few countries we’ve needed them, they’ve been very easy to find and after a couple of packets, they’ve set us right in a day or so2. 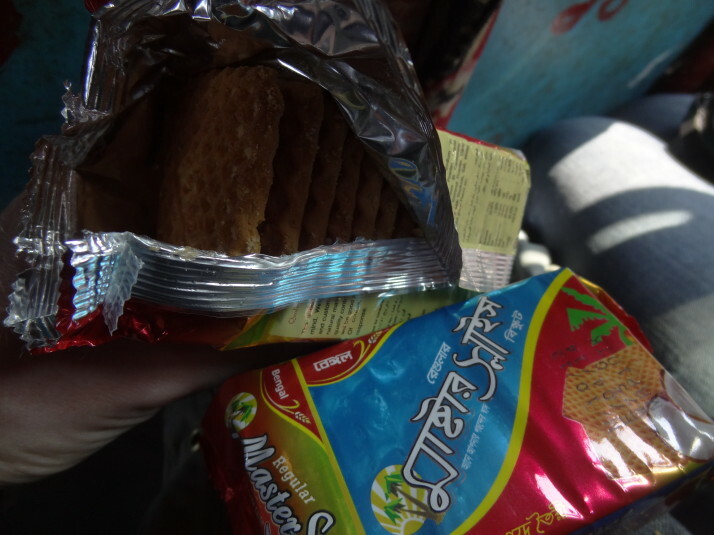 After first discovering their powerful healing properties while suffering the Shanghai sh*ts in Hampi, southern India, we’ve referred to them ever since as magic biscuits. 2 Note that it’s always a good idea to keep your fluid levels up regardless, but the dryness of the biscuits means we tend to drink more liquids such as water or tea than we’d normally do. Rehydration sachets are also a very good idea, nay, required if you find yourself squatting frequently to relieve the Saskatchewan squits. That’s the last of them. I promise. 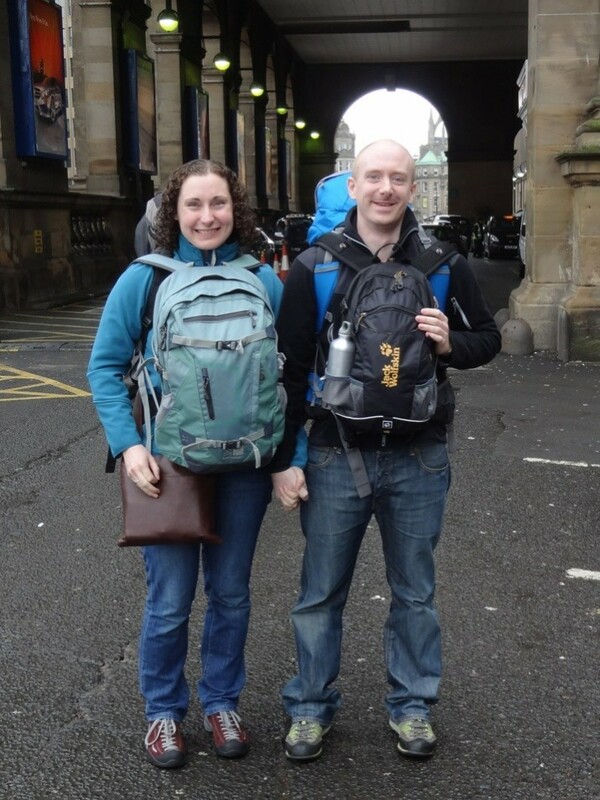 This entry was posted in Travel and tagged Magic Biscuits on March 24, 2014 by Andrew. 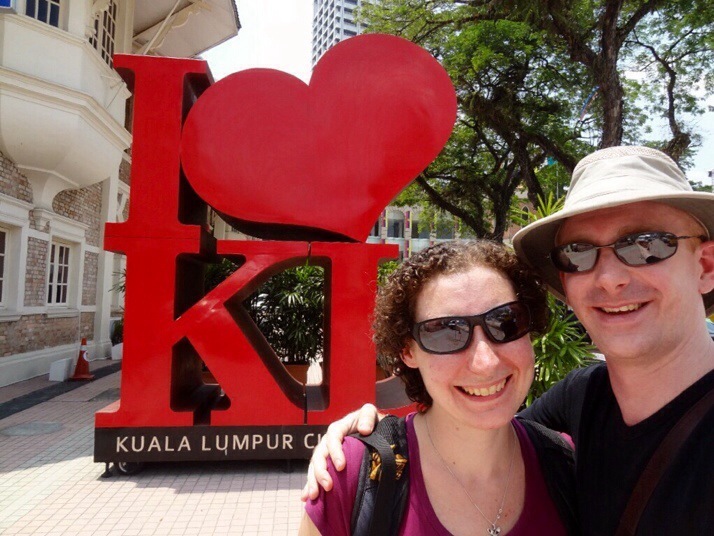 We weren’t sure what to expect from Kuala Lumpur before our visit, but we both ended up loving it. It’s a relatively small city and the central area is more or less walkable supplemented by an easily navigated public transport system, the traffic was more orderly than we’ve seen since Hong Kong (I’d say it was a legacy of British colonialism but now we’ve seen the chaos of Bangladesh’s streets my theory is completely overthrown! 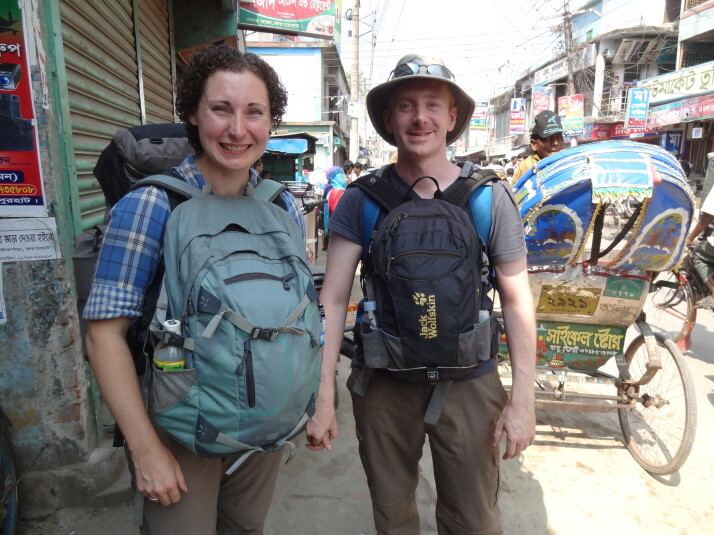 ), and it was full of interesting and varied sights – more than enough to keep us going for a week at our leisurely pace, but unfortunately we only had three days. 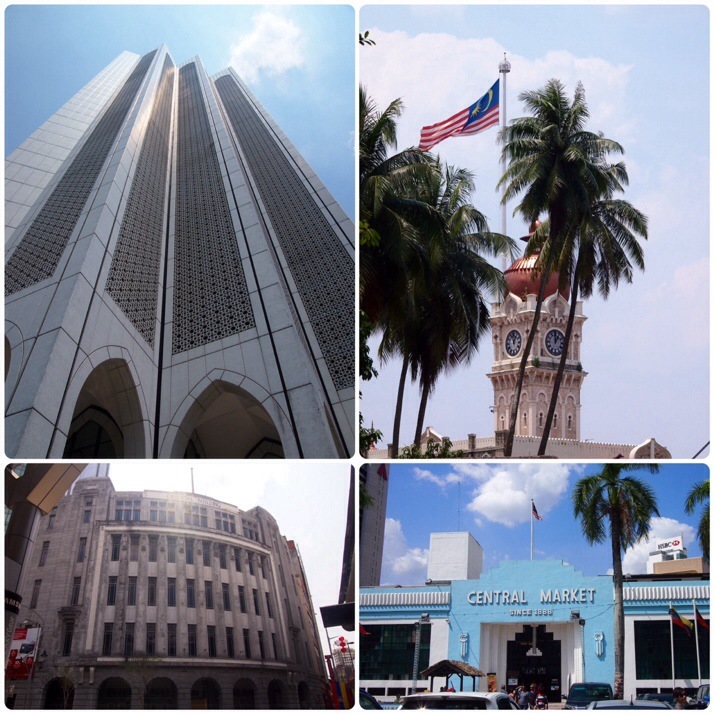 The only down-side was the extreme heat and humidity (it’s not even the hot season yet) but that just meant lots of stops for cool drinks and occasional breaks in air-conditioned shopping malls to cool down. 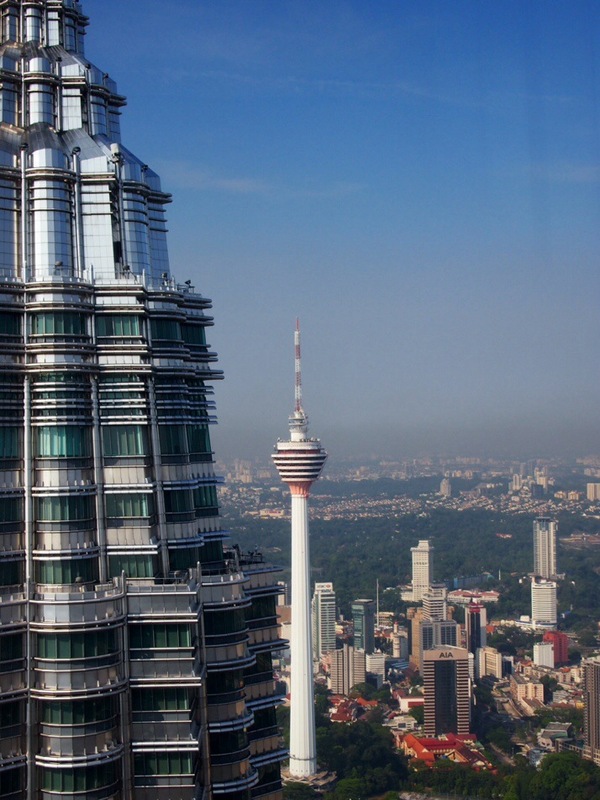 The iconic image of Kuala Lumpur is the Petronas Towers, the world’s tallest twin towers at 452m high, and for a time (from 1998 to 2004) the world’s tallest buildings. They were designed to incorporate features of Islamic architecture, for example the cross-sections of the tower are based on a Rub el Hizb, the eight-pointed star, with additional circular sectors to allow for more interior space. Another influence can be seen in the pinnacle spires which echo the design of a mosque’s minaret. We always like to climb towers for the view wherever we go, from Riga to Yekaterinburg to Hong Kong on this trip, and when we visited Croatia in 2012 it felt like we climbed a church bell tower practically every day! 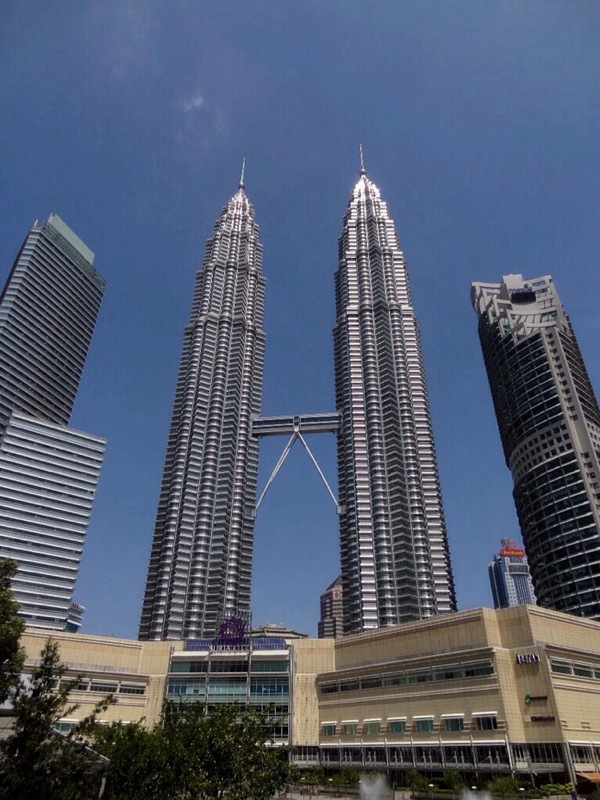 The Petronas Towers can only be visited by guided tour at specific time slots with tickets for each day going on sale first thing in the morning and selling out quite quickly. Having joined the queue at 7.20am, more than an hour before the ticket office opened, we managed to secure tickets for the 9.15am time slot. The tour began with a safety briefing projected onto smoke (I was so interested in how it worked that I forgot to listen to the emergency procedure…) before we boarded the lift to the Skybridge at floor 41. The Skybridge connects the two towers but is not connected to them. It is designed to slide in and out so that it doesn’t fracture when the towers sway. 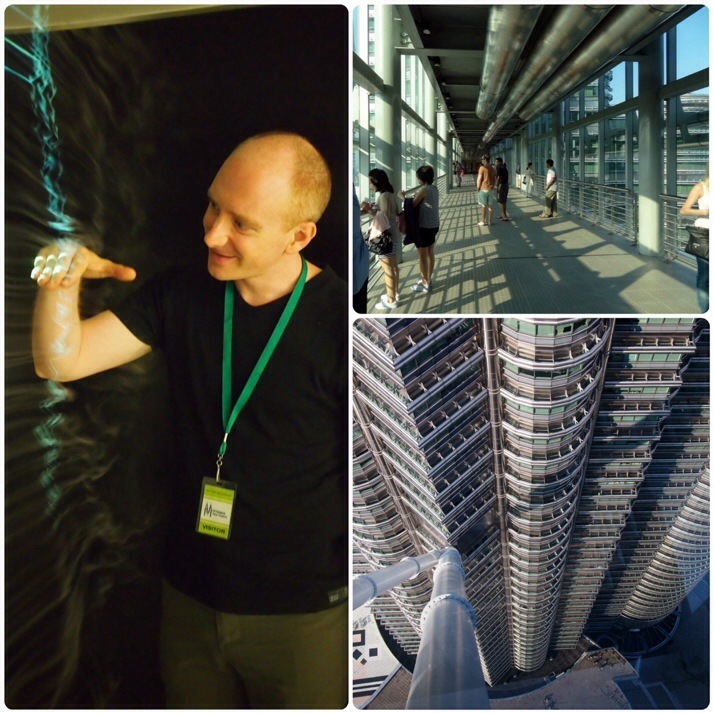 Finally we boarded the lift again to whizz up to the observation deck on floor 86 (the total number of floors is 88). The lift moves incredibly quickly (between 3.5 and 6.0 m/s) with the executive lifts taking just 90 seconds to travel from the basement to the top floor. Even in the tours lift we could see the floor counter going up at roughly one floor per second. 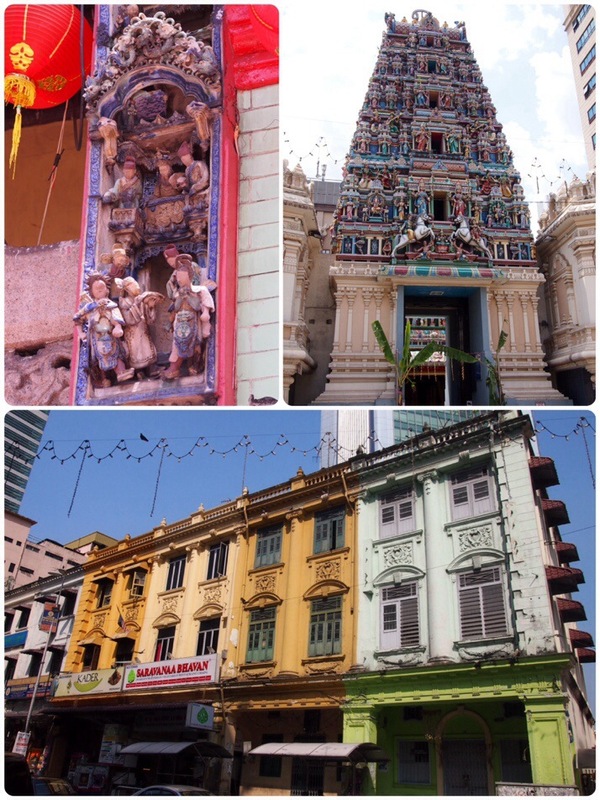 Another popular thing to do in KL is to walk around its Chinatown. We had picked up a city map from our hostel which was helpfully marked with a couple of walking tours and information about some of the historic buildings so we spent a couple of half days wandering around and enjoying the varied architecture – everything from a traditional Chinese clan house to a Hindu temple to British colonial buildings to a hundred year old Mughal style mosque where we were given a guided tour by a very friendly volunteer and I was required to wear a not very fetching purple robe complete with hood… Many of the shopfronts in Chinatown are now below street level and the doors have been reversed so that they open inwards. This is because over the years more and more utilities have been laid under the roads thus raising its level and leaving the buildings below. 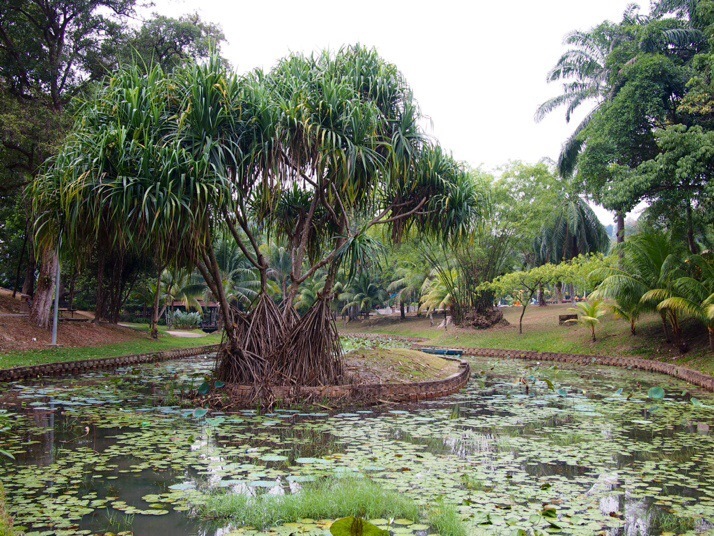 On our final day we planned to do the final walking tour on our map which highlighted various points of interest in and around the Perdena Botanic Gardens, but we quickly became very lost and even after finding a plan of the park we couldn’t match the landmarks to those on the map. 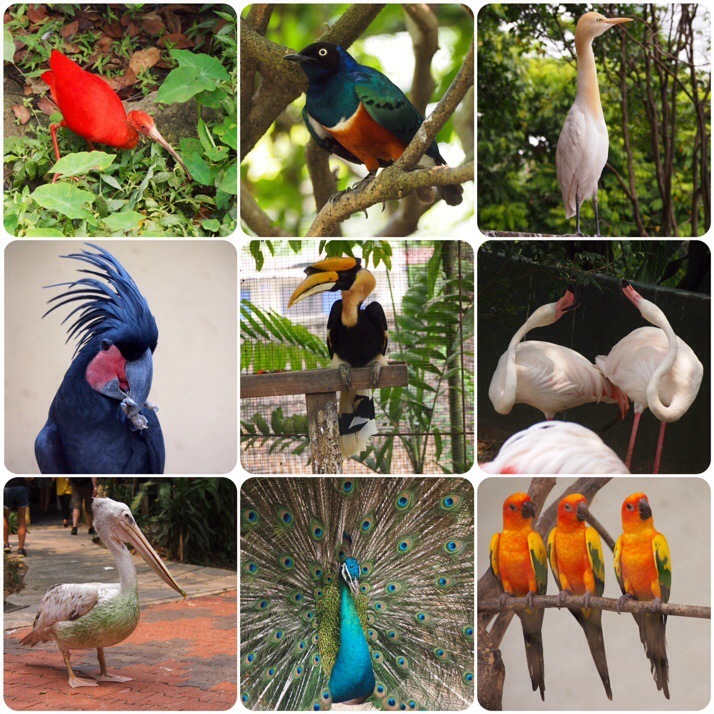 So we gave it up as a bad job and spent the rest of the day in KL Bird Park, SE Asia’s largest covered aviary, where it was difficult not to take hundreds of photos of the hornbills, egrets, parrots and other exotic birds! 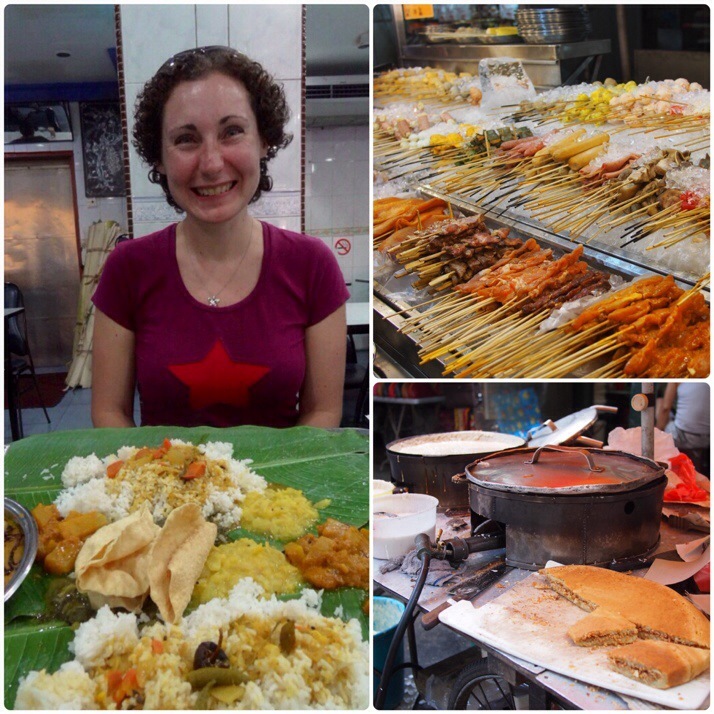 Although we only spent three days in Malaysia we did our best to try a good sample of the local cuisine. I was surprised to find out that satay comes from Malaysia and not Thailand as I’d always thought, and we had a fabulous dinner at a street restaurant where we chose our skewers to be barbecued and then doused everything in delicious peanut sauce. A bizarre local specialty is Cham, or Hainan tea, a mix of 40% coffee and 60% tea – I wouldn’t recommend it… On a more pleasant note, for lunch on our second day we ate at a South Indian restaurant in an Indian section of the city and our huge and delicious meal was served on banana leaves. Arriving at the airport by the airport express train from Sentral station we were surprised to find that our flight wasn’t on the departures board. After checking with the information desk, it seems that our airline had changed the flight time by 8 hours but hadn’t thought to communicate that fact to us (OK, I’ll name and shame them, it was Biman Bangladesh)… Fortunately we were able to book seats on another flight at a similar time to our original one and we arrived in Dhaka on time for a month of exploring Bangladesh but with Malaysia firmly on our list of countries to revisit. 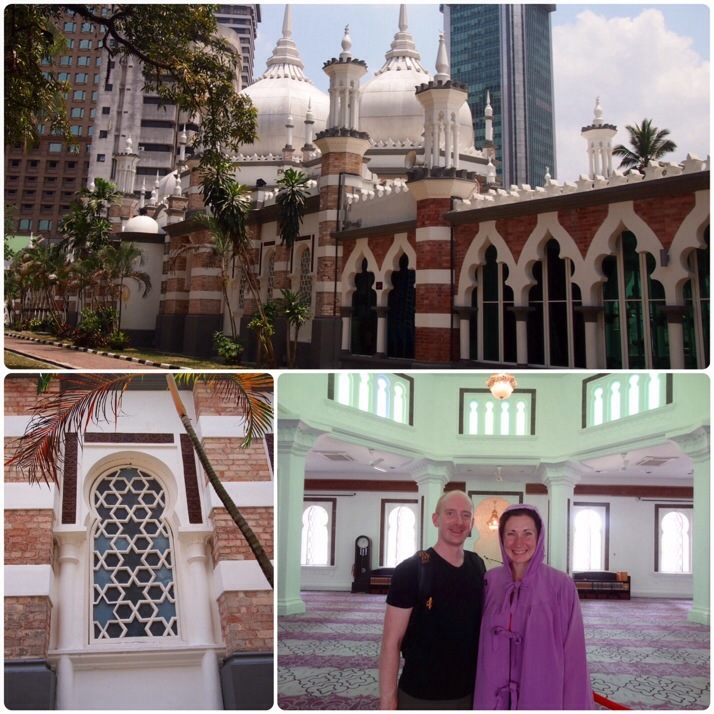 This entry was posted in Places and tagged Kuala Lumpur, Malaysia, mosque, Park on March 21, 2014 by Julie. Half way – year 2 begins! It’s exactly one year to the day since we frantically packed our bags, handed over the keys to our house and set off on our two year trip.. The destinations for our first year were largely planned ahead of time, but this second year will be a little more spontaneous – from Bangladesh we’re going to Singapore for a week, then we’ll see how much raw fish we can eat in Japan. After that, we don’t yet know! Thank you for following and commenting (hint ;o) on our adventures.. This entry was posted in Travel and tagged 1 Year In on March 19, 2014 by Andrew. What photo takes you right back to Thailand? Closely followed by our Trans-Siberian trip through Russia, Thailand is the country we’ve spent the most amount of time in so far – mostly because we needed a break from the constant travelling. Summarise Thailand in three words. The street vendor or shopkeeper is handing you your food or goods, having placed them in one of every size of clear plastic bag they can find – we once bought some diced chicken that the butcher put in 4 plastic bags! What one item should you definitely pack when going to Thailand? 1 Except high-end Panasonic digital cameras, it seems. I had read about the GF6 and wanted to compare the size to my trusty Sony HX9-V, and we finally found one in IT City in Bangkok’s Pantip Plaza. They only had a white one in stock. This entry was posted in Places and tagged Round Up, Thailand on March 18, 2014 by Andrew. 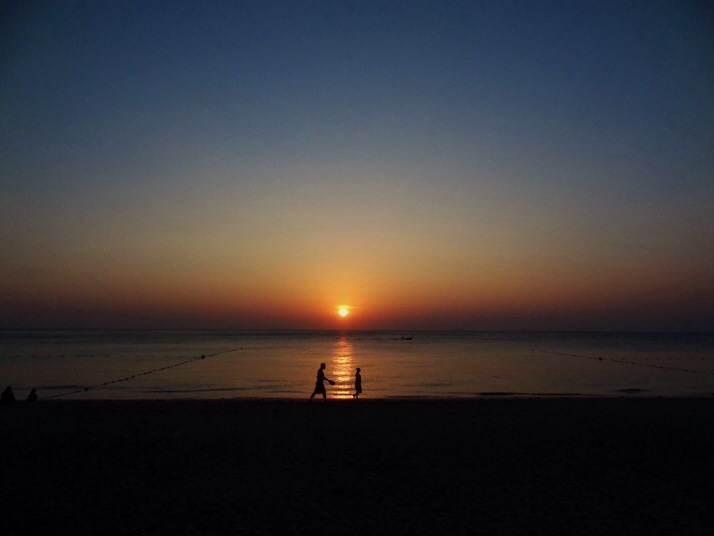 To round off our 3 month recuperation in Thailand, we headed for its famous southern beach islands, and as we’re more fond of a good night’s R&R than all-night R&B, that meant the less party-orientated island of Koh Lanta. At least, that’s what our research led us to believe. As much to the distress of our hosts for their guests as for their own 2 year old daughter, the neighbouring bar had their house band play every night from 9pm until midnight – against the generally understood policy of one late night per venue, per week. Our room was the closest to the stage, though I doubt it mattered – even with the ill-fitting door and windows closed, we still had front-row fidelity. And volume. The band, from another of Thailand’s islands leaned towards the heavier side of classic rock; Metallica, Hendrix, Dire Straits – it could have been a lot worse. Our otherwise delightful abode was at the southern end of Phra Ae beach, which is also known as Long Beach, because, well, it’s a beach. We spent a couple of lazy days on and around the beach, then on our last full day we hired a scooter to visit the Old Town on the other side of the island. 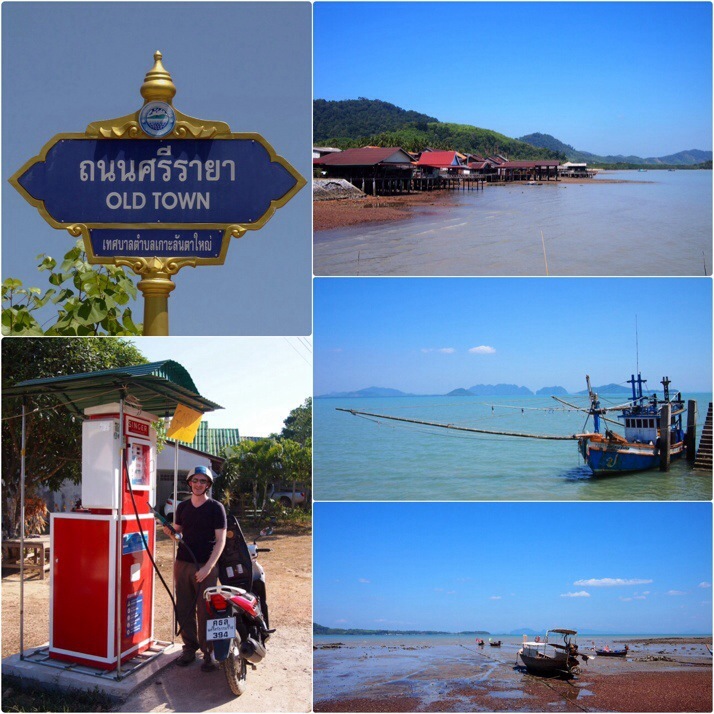 As with most places we’ve visited thus far, Koh Lanta is somewhere we could easily spend twice as long exploring. We loved its laid-back, no trouble vibe, its scenery and its beaches – all of which draws an eclectic mix of visitors and expats. 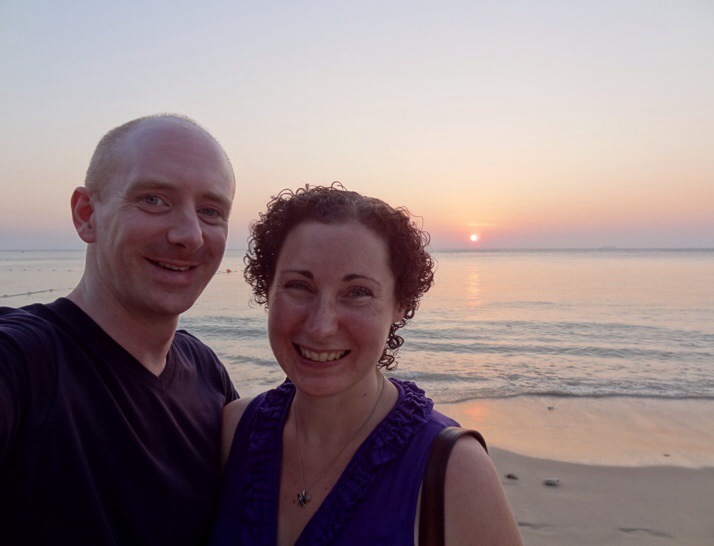 This entry was posted in Places and tagged Koh Lanta, Thailand on March 16, 2014 by Andrew.